Is that our food or the dog’s? Wow, talk about questions you never wanna hear from your family and friends! I guess I should have expected it, though. And, in all fairness, it is probably a good question to ask around our house. I’m sure you figured out by now that I’m kind of a ‘natural’ freak, right? So, it really shouldn’t be a surprise when you learn that I’ve applied that to my entire life ~ including my dog. Living 2 miles from a dog food factory doesn’t help. I gotta tell you, there is nothing more stomach-turning than walking outside on the days they are cooking their food and being greeted by the smell of…well, I don’t really know how to describe it. Either way, I sure don’t wanna feed that to my dog. So, what’s the alternative? For me, it was raw food diet. I know the arguments against it. Really. I do. I’ve read and heard them all. After weighing all the evidence, though, I’m convinced it is the better option. I’ll admit, I tried it on our cat. She wanted no part of it. I tried it on a couple strays that we took in. They weren’t going for it either. 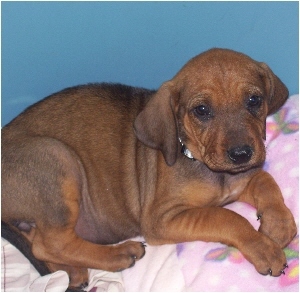 The day we picked her up, she was 6 weeks old and living in 20′ x 15′ area with her mom, her dad, two other adult dogs and a two litters of other puppies. You could smell them from the driveway and we couldn’t get back to her without stepping in multiple, immense piles of dog crap. She was the one on the bottom of the pile of puppies that were all attempting to eat from one metal trash can lid. She was the smallest and she kept getting shoved aside by the others. She would whimper and dive back in. It was sickening and heartbreaking. And when she spotted us and looked up at us with those big brown eyes, it was all over. The drive home was a nightmare. She stunk to high heaven and she must have puked on my car mat 5 times. My shoe, she got twice. Then, we got her home and set her down in the yard. Her first poop revealed a massive amount of worms and her little body just shook on her wobbly legs. You do realize that’s like asking if I took my kids to the doctor to get their vaccines updated, don’t you? Instead, the little light bulb over my head sprang to life. Here was an animal that just might accept the raw food diet. Of course, I didn’t have any on hand, nor did I have the stuff necessary to make it. So, I settled for an all natural dog food until I could make it to the grocery store. In the mean time, I studied up on the best foods to incorporate, the necessary herbs to get rid of the worms, and the supplements I’d need include to meet all of her needs. The first few days, we just kept her on the commercial dog food. Call me lazy, but it was made with ingredients I could accept and she seemed to like it. The herbs, we started immediately. We used diatomaceous earth, psyllium, clove, anise, juniper berries, wormwood, turmeric, alfalfa, kelp, pumpkin seeds, parsley, thyme, cayenne and slippery elm. Within hours, she was eliminating tangles of worms like I can’t even explain. It was easily one of the grossest things I’ve ever seen in my entire life. I should also insert here that, if you have not been trained in the proper usage of herbs, don’t run out and buy these and try mixing them yourself. If you don’t know the correct proportions and proper dosage, you are going to cause your dog more problems than you are going to fix. After about a week, she was down to only a couple of worms a day being eliminated and within 2 weeks, the worms seemed to have disappeared completely. I wiped the sweat from my brow and turned my attention back to the raw food diet. While the commercial food was alright, I noticed that she was still having belly issues. Loose stool, terrible gas and constant growling/gurgling sounds in her stomach. 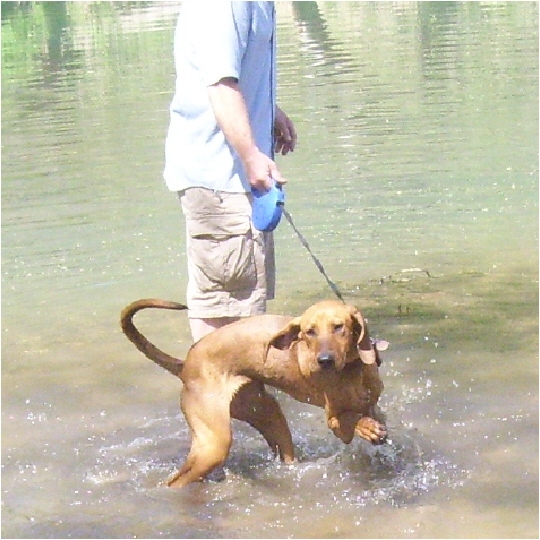 A bit of research revealed that this was a common problem with coonhounds. Adding rice to their food was the recommended course of action. The true beauty of my plan was that, with the exception of the kale and mustard greens, these would have been on my list anyway. The downside, this was gonna cost a bit more than a bag of dog food. However, it was going to be a lot cheaper than a vet visit and treatment. When I got home, I set to work preparing my first batch of raw dog food (aka BARF. Yes, really. Go ahead…google it!) I had to take into account a couple of things when starting this process. 1)a dog’s digestive system doesn’t break down fruits and veggies like a humans. This means that you need to make the individual pieces as small as possible so the food gets broken down and absorbable before it gets eliminated from the system 2) Dogs need more protein than humans, as well as raw bones and flesh. Cooked food is as harmful to animals as it is to humans. Don’t believe me? Let me know the next time you see an animal cooking its dinner. So, I started cutting. And I kept cutting. And cutting. Two hours. I’m totally not exaggerating. After two hours, I had a very large bowl of salad ready for my dog. Almost. My next task was to cut up a chicken. I got an antibiotic and steroid free, free range, grass fed chicken, including the internal organs and neck bone for $6.50. It was thick and tender and raised locally. Bonus! I broke the chicken up into pieces and cut the meat into bite-size chunks, then mixed it in with the salad. Next came the brown rice, garlic and eggs (The entire egg.) We ground up some sunflower and pumpkin seeds with the egg shell and added that. Someone suggested wheat germ oil, aloe vera juice and olive oil. Since these are common items in our house, we added those. We poured in some honey and added the herb blend. Then, we were finished. I put some in a gallon bucket and stuck it in the fridge. I filled a couple of gallon freezer bags and stuck them in the freezer. And, I filled a bowl for Lucy. She never flinched. In fact, she inhaled her first bowl and tried to mug us for the rest of it. She hasn’t stopped eating since then. My dog will take you down for a bite of your salad. Now, fortunately for me, this was just a few days before Yule. Let me tell you how that works around our house. It’s December 23 and suddenly we all realize that we only have one day of shopping left and we have gotten nobody anything at all. So, we all take turns trying to sneak off and get the best ever present possible. It seems to work for us. Usually. I’ll admit to this ~ I’m a sucker for a handy kitchen gadget. It doesn’t matter if I’ll ever use it or not. It really doesn’t even matter that I don’t truly know what it is for or how to use it. I still want it. If you really wanna bring me to my knees, put a new food processor or juicer in front of me. That’s what my family did for me this Yule. I got a new food processor, a new blender and a new juicer. Jackpot! If you could only imagine what a happy girl I was! My juicer cut my dog-food making time way down. What took me nearly 3 hours to make the first time, now takes about 30-45 minutes and I have enough food to last her about 2 weeks. I just throw everything but the meat in the juicer. It shreds up the fruits and veggies and separates the juice from the pulp. After I run it all through the blender, I mix it all back together. This way, the pieces are all super-small, so her system digests them much more efficiently. She is still getting all of the vitamins and other nutrients her body needs, plus the fiber from all of the shredded plant foods. I make up larger batches of the herb blend and just add some to the food. I put in a bit of distilled water and apple cider vinegar. The downside, like I mentioned earlier, was the cost. I’m the first to tell you that, in order to be sure your dog is getting everything they need, it requires a large assortment of foods. If you choose this route, you can expect to spend $20-$25 per week on food/herbs/other ingredients if you have a small-medium-sized dog. That’s if you shop carefully. For medium-large dogs, add an extra $10-$15 to that. I have found that the extra cost is well worth it. This is Lucy now. She looks a bit skinny most of the time, but she is by no means malnourished. She has broken 2 leashes in the last month. Her newest game is to pull my teenage daughter down the street on her bike. It is second only to playing ‘follow the nose’. It is a chore to take her for a walk because her nose tends to lead her astray and before you know it, there you are being drug down the road by this skinny red bag of bones. Oh, the indignity! I don’t wear skirts on our walks anymore. The point of that was, obviously, this is working for us. I have recently adjusted her herbal supplement blend. We kept her on the original blend for 6 months to be sure the worms were completely gone. Now, we’ve taken out some of the original herbs and replace them to include some herbs that promote bone and joint growth, as we learned that this type of dog is prone to hip and joint dysplasia later in life. Vitamin A, B1, B2, B3, B5, B6, C, E, K, folate, calcium, copper, iron, magnesium, manganese, phosphorous, potassium, selenium, sodium, zinc, amino acids, chlorophyll, folic acid, iodine, chlorine. That’s just in the spinach. Do I think we should just feed our dog spinach and leave it at that. If you really think that, please stop reading and back away from your monitor. You should definitely check out some of the links I’m including. This is by no means something you should undertake without studying for yourself both sides of the issue. Learn about the specific needs of your breed of dog. Learn what their common ailments are later in life. Seriously consider the cost and effort required. A last word, then I’ll end this eternally long post. In the past few months I’ve had the opportunity to see this diet work near miracles. A family member owns a Blue Heeler who is 12-13 years old. She has always enjoyed doing what Blue Heelers do…herd livestock. Unfortunately, this means she’s taken a few horse-kicks in her time. She developed severe arthritis that made it difficult for her to get up/down and to move around, which contributed to her becoming overweight. A tumor developed near her front leg that was about the size of a baseball and her eyes were cloudy with cataracts and red. She was barely able to see and she was almost totally deaf. She started on this diet and within 2 weeks, she had lost a noticeable amount of weight, she was getting up and down far more easily, the tumor shrank to approximately half the size and her eyes were becoming clearer. Within a month, her eyes were clear, the tumor was about the size of a golf ball, her hearing was improving, she had lost nearly 10 lbs and she was playing with other dogs. It was truly an unbelievable thing. Had I not seen it for myself I wouldn’t have believed it. Fortunately, the owners kept a video diary and a journal of the experience. One more last thing…you all know I’m not a vet. I’m not trying to tell you to run out and start your dog on this diet. I’m not here to debate the topic. I’ve already made up my mind. I’m not telling you that most of the common ailments found in dogs will improve, nor am I telling you that your dog may live a longer healthier life. That would be almost like giving advice and I can’t give you advice on your dog’s health and/or nutrition. I’m just a simple herbalist. Okay, I’m shuttin’ up now.